Newcan is capable of producing high volume, precision metal stamping for the filtration, automotive, and electronics industries using sophisticated, high speed progressive or compound dies designed specifically for the application. Newcan utilizes ejection devices and feed mechanisms on our equipment to obtain optimum production speeds. High volume, precision stampings are produced on sophisticated progressive dies at speeds up to 250 per minute. Progressive tooling concepts control the part throughout the entire high speed process. Unique ejection techniques eliminate the possibility of die breakage and permit optimum production speeds. Production of complex components are solved by experienced engineers at the drawing board before a die is built. Precision stampings are consistently produced to customer specifications through the use of raw materials with ideal blanking and drawing properties. NEWCAN customers are confident that no compromise is made in the selection and proper use of material. Stampings are produced on precision double crank, straight side presses that have the tonnage and power to attain the desired speeds and the rigidity and support to cope with eccentric tooling loads. Modern feeding and straightening equipment complement each press. 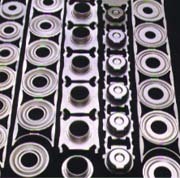 Proper die construction is carefully combined with the correct press to provide customers with prolonged tool life, uninterrupted production, and parts to print.